Two faculty members from the School of Pharmacy were honored as inductees to the University Research Hall of Fame at a ceremony and reception on June 24. 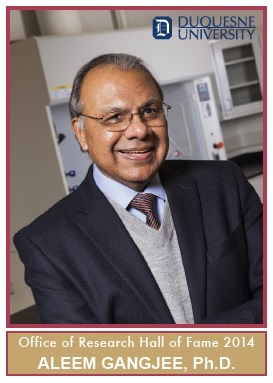 Dr. Jane Cavanaugh, associate professor of pharmacology, was honored as a first-time inductee; and Dr. Aleem Gangjee, distinguished professor of medicinal chemistry, was honored for a second time. According to Dr. Cavanaugh, the awards are given based on grant money received, excellence in scholarship, and involvement in University committees and community service. Each inductee is provided with a box of baseball-style "trading cards," which have a photo on one side and information about research and grant awards on the other. Dr. Cavanaugh, who has been a faculty member of Duquesne's Graduate School of Pharmaceutical Science since 2006, has been awarded approximately $865,000 in grant funding. Her Hall of Fame Trading card reads: Dr. Jane E. Cavanaugh is a pharmacologist with research interests in neurodegeneration and how diseases, specifically cancer, may differ in elderly patients, with the goal of promoting healthy aging and age-specific therapies. She and her colleagues have found that healthy brain aging may be promoted with a diet rich in antioxidants, such as resveratrol. Additionally, her research group has developed and tested novel inhibitors of a signaling pathway that promotes breast cancer cell proliferation. "I was shocked and honored to receive this recognition," said Dr. Cavanaugh. She said she was especially honored to be recognized alongside Dr. Gangjee and fellow inductees Dr. Alan Seadler, associate academic vice president for research and technology, and Dr. Jeffry Madura, professor of chemistry and biochemistry, who was inducted for a second time. 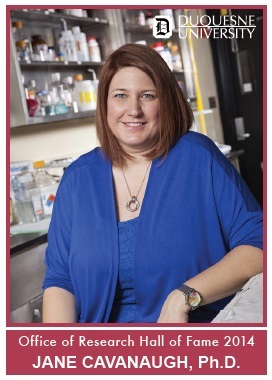 She added that she gives a lot of credit for her success to her graduate students and undergraduate students who help her every day in the lab.